This is why there are so many empty seats at Rio. There are many unanswered questions at the Rio Olympics. Why don’t the gymnasts sweat off all that makeup? Why don’t the water polo players get wedgies? Why IS that pool really green? And why are there so many empty seats at what is meant to be the greatest spectacle in the world? Viewers of the Rio Olympics have been left wondering where are all the spectators as stadium after stadium of empty seats are shown right across venues in Rio. While TV angles and official photos try to cram in shots of excited fans the wider shots tell a different story. This canoe/kayak course is AWESOME! #Rio2016 #GoTeamUSA ???????????????? But images show a different story with less than 500 people attending the boxing earlier this week, the equestrian stands showing row after row of unused seats while beach volleyball stands are painfully empty. 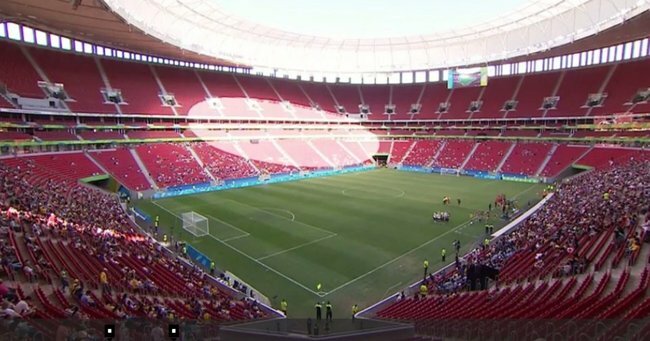 Many of the empty swathes of seating would have been filled in past Olympics by sponsors but at Rio they have shunned the games after fears over safety and the Zika virus. So many empty seats at swimming. Brilliant spectacle at ridiculous hour to suit US TV rather than the Rio public who paid for all this. Fears over the Zika virus may have also put tourists off attending the Games, as well as the no show of many top athletes such as Rory McIlroy and Adam Scott. Some sporting events have not been popular with Brazilians – such as hockey and rugby sevens – as they are not traditional South American sports. However, about 75 percent of event attendees so far have been Brazilian, according to the Associated Press. Donovan Ferreti, Rio 2016’s ticketing director told The Daily Mail South Americans are notoriously late buyers – with lots of tickets being bought at the last minute. Am I the only one who think it&apos;s sad that there&apos;s so many empty seats at Rio in the dressage arena? ???? Desperate to fill the spots athletes have been taking to social media to encourage fans to fill the venues. Olympic great Usain Bolt has encouraged fans to come along with a video on his Twitter account. As a last minute option tickets allocated to sponsors or corporate guests who have failed to show up are in the process of being redirected to 240,000 schoolchildren who organisers hope can take the day off school and fill the empty seats.